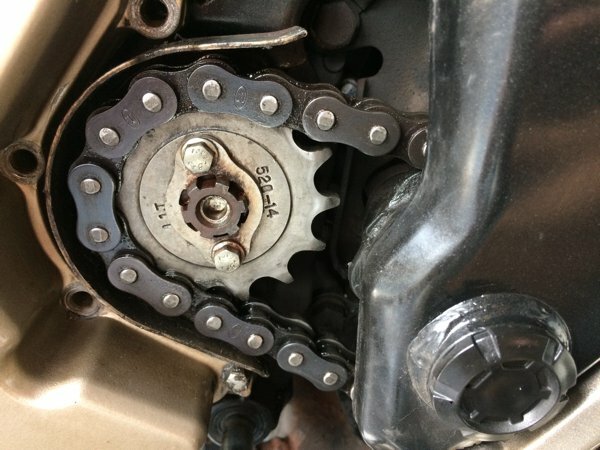 When was the last time you opened up the front sprocket cover when chain cleaning? I don’t know about you, but I’ve been rather lazy to do just that. For the last 10,000km since the chain and sprocket set was replaced, I don’t recall myself opening up the front sprocket. After all, why does one need to? Especially if you’ve been diligent about cleaning and lubing the chain, right? MASSIVE accumulation of gooey, pasty gunk! I would estimate this pic to contain only about 1/4 of the total gunk I eventually removed! I returned from a trip to KL (yes, on my Pulsar 200NS) and it was time for some bike maintenance. 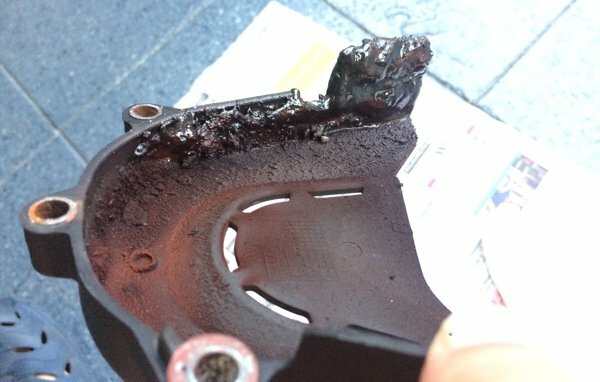 Yes, and my Pulsar 200NS has accumulated a MASSIVE amount of gooey, pasty gunk at the front sprocket area. I was surprised at the consistency of this paste. In fact, it feels almost exactly like a 2-part epoxy mix just as it’s about to harden. Yes! I’m NOT exaggerating! Super sticky gooey paste! And I was just about pondering over my recently dropping fuel economy. 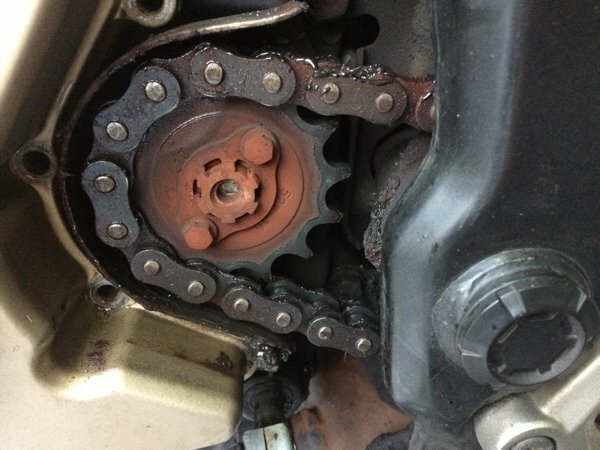 The badly neglected front sprocket – home to the sticky gooey paste. 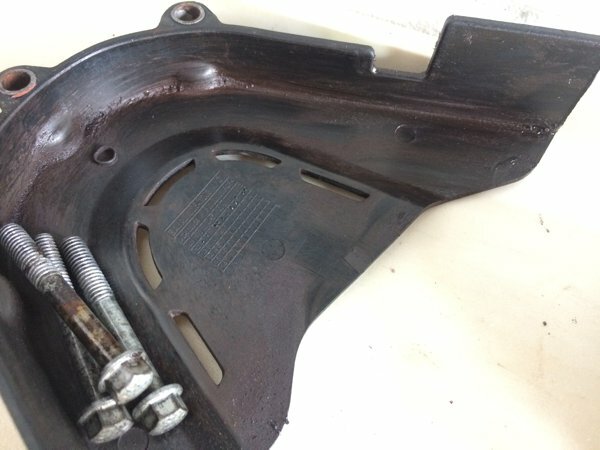 In fact, I had a little trouble removing the sprocket cover as the gooey paste was so sticky that it glued the sprocket cover to the sprocket housing. With the cover removed and when I looked at the inside of the cover, I literally spotted a blob of this paste at the bottom of the cover! Yucks!! What a gooey mess! So I spent the next half hour or so removing that messy, sticky, gooey, pasty gunk, and got my hands pretty messed up too. Also took the opportunity to rub down the chain with loads of WD40 (cheap cleaner) and some Motul Chain Cleaner (the more expensive stuff). Ah! That’s more like it! Nice and clean! A world of difference, eh? That’s the same chain and front sprocket – just a lot cleaner! Out with the old Motul 7100. At 4,800km it still looks cherry-coloured! Cleaning the magnetic oil strainer. Not overly happy with the teeny weeny bit of iron filings (the black stuff) wiped off from the magnet. Feeding my Pulsar 200NS Motul 7100 15W50. Fresh blood! Fresh, red blood! 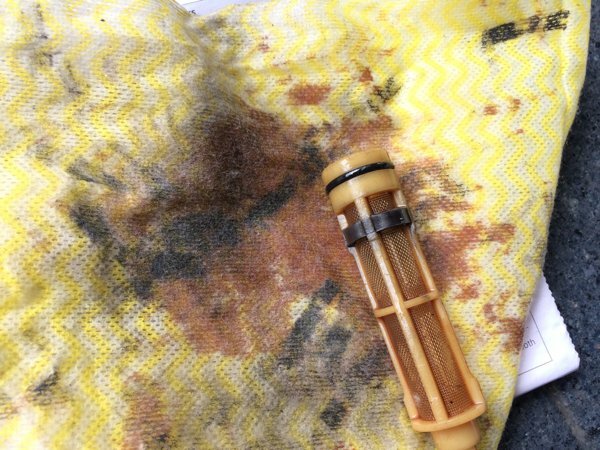 Replacing the oil filter was a little messy and resulted in some oil dripping onto the floor. Luckily I had some shop rags nearby and soaked it all up. Sorry, was busy catching the oil, so no pics of the filter. You see, this is one reason why I like maintaining my Pulsar. I suspect most workshops will not bother to deep clean the accumulated gunk. It’s a messy and time-consuming job. But it’s exactly stuff like this that robs the motorcycle off its power. Of course, bike tinkering also happens to be a hobby of mine. My NS’ chain is making noise while riding which is very irritating. Whenever i release the throttle and pull the clutch, the noise gets more prominent as if the chain is rubbing against something (sounds like “khrr khrr khrr” at regular interval when the clutch is pulled). The chain is properly tightened with required slackness. What must be the issue?? There’s no way to tell without physically examining your bike. Why don’t you take it to your nearest service centre to have a look? Assuming your chain is properly tightened, it could be your sprocket bearings. Also check for uneven chain wear. Also, unless you’re absolutely certain the noise is coming from the chain, do not rule out the possibility of the sound coming from your wheel bearings too. The chain travels in an uneven up and down manner when the wheel is rotated. The chain does not travel in a straight line. Anyways, I shall take it to the Service center soon. That means ur chain is getting loose. Its either the sprocket or the chain itself. From past experienced, I changed to DID chain recommended by Ah Tek. @Sumedh – Ah Tek is the lead mechanic at the Singapore’s Bajaj only dealership and is very experienced with the Pulsars. It is the chain slider (rubber between the chain and swing arm) that got completely rubbed off or could be loose chain that sometime hits the silencer . 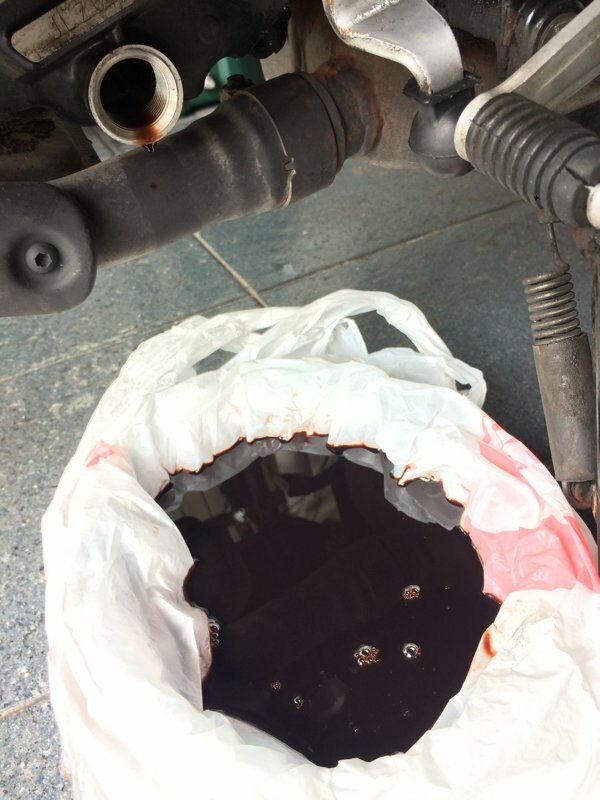 Curious – How do you dispose of the engine oil? The place I purchased new oil from collects used oils too. I see. Care to share the address? I’ve been holding back on doing oil changes as I can’t find a place to dispose of the used oil. Seriously? No! Don’t do that – almost all bike workshops I know will be happy to dispose the used oil for you. Holding back on an overdue oil change is not gonna make your engine happy. For inexpensive Motul, I get it from MXtradings.com in Ubi. They sell the 7100 for $21 a bottle. A workshop very near my home sells it for $25 a bottle if I decide to get lazy and have them do it for me. 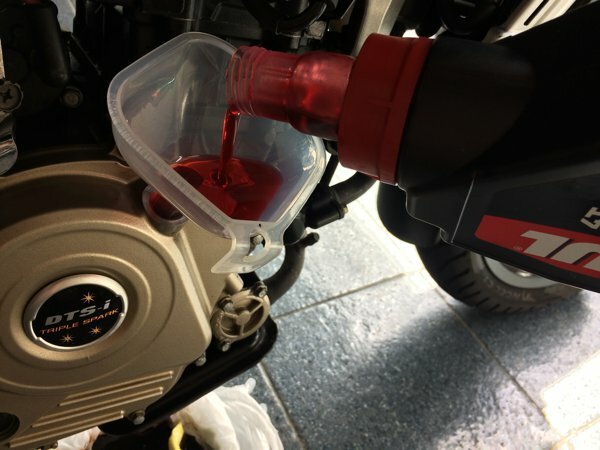 Lim Ah Boy sells Motul’s 300v and Bel Ray oils – another highly acclaimed oil amongst bikers here, and you can use their workshop in Geylang for oil disposal. Hi bro, what’s the tool you used to open those nuts on the sprocket cover? I am not so well versed with tools but I want to clean the sprocket too. 8mm hex socket. $2 from Daiso. D, where / how do you dispose of the old engine old? Into the dumpster? I put it back into the old bottle and bring it to a nearby workshop. They have a collection drum that’s some recycling guys periodically pick up from them. Previous Previous post: Passed my Class 2A License Test!